It’s the season for Sinterklaas again — and that means chocolate initials. We’ve had some random initials given to us: last weekend we went to shop at a wholesaler, and at the cash register we got a chocolate initial ‘S’ (the generic default, from ‘Sinterklaas’) gifted to us. It is (or rather: was) a 600 grams monstrosity of kruidnoten (with a slightly almond-like bitter taste, almost like cantuccini) glued together with milk chocolate and little chocolate crispy balls. It took us two weekends to work our way through it! Is Sinterklaas the 6th? 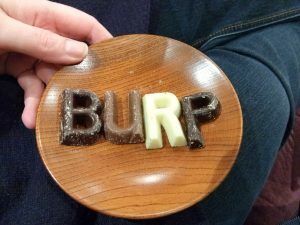 What are the chocolate initials all about? Yes, St Nicholas' nameday is the 6th, so the 5th is St Nicholas Eve. 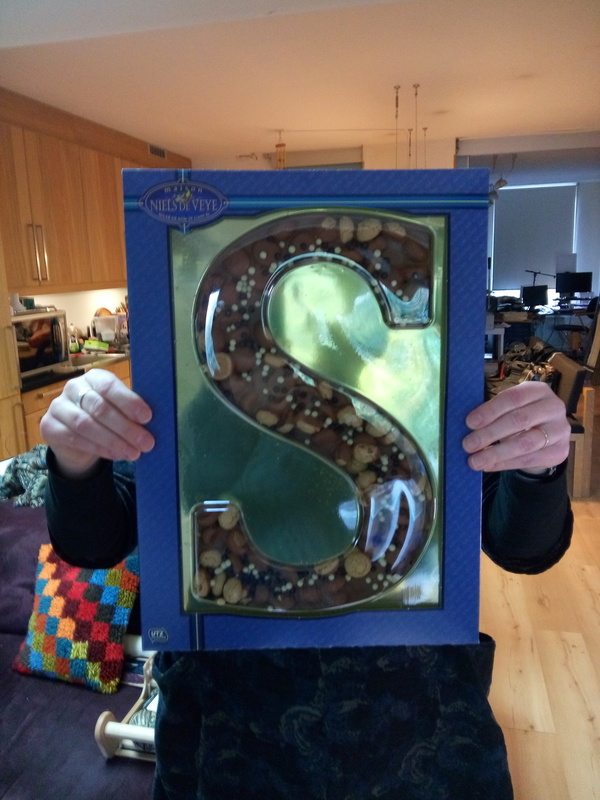 I don't know when the concept of chocolate initials started, but for as long as I can remember, every Sinterklaas we got a chocolate initial among the gifts. It is the privilege of the grandmother in the family to buy them for everyone. So I get an 'H', my sister gets a 'P', etcetera. The initials all have the same weight, so the thickness varies with the letter itself. The "I" is really thick, but some brands make essentially two I's to compensate for that. Ah, that's it. So, do you guys do anything on 25th December? We value those traditions a lot, and Christmas gift-giving just doesn't have those. Sinterklaas sounds like a lovely and delicious tradition! I am totally envious for it!!! It's basically our gift-giving occasion, mostly for children, instead of Christmas. We don't have any 'believers' in our family anymore, but we still keep that tradition alive. Though since my sister lives in Denmark and they visit only at the end of the year, we do celebrate it at Christmas -- but it's still Sinterklaas, not Christmas!